Welcome to the review of the Kookaburra Stinger hockey stick. Why is it that Kookaburra makes such great hockey sticks cheaper than anyone else? 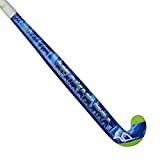 Personally I love Kookaburra and if you are looking for an awesome Low Bow, high carbon great quality hockey stick then the Stinger could be just what you are looking for. Your bank balance will appreciate it to. What makes the Kookaburra Stinger so good? Well let’s talk about carbon for a minute. Carbon is the major differentiating factor in hockey sticks. The material makes sticks stiffer so they hit the ball harder and more hardwearing allowing them to last longer. With 75% carbon fibre content the Kookaburra Stinger is up there with the higher end sticks we review. Now the hockey sticks with 90%+ carbon fibre you will get a stick that is very very stiff. It takes a change in style for most people to play with a hockey stick that stiff and this is where the Kookaburra Stinger stands out. You here a lot about “feel” when describing hockey sticks. Balancing the carbon fibre content in the Stinger, with the fibreglass and Kookaburra’s “SFR” – Soft Feel Resin, your get load of feel. Receiving the ball with the Kookaburra Stinger is easier than with higher carbon content sticks. It has a little give because of the material used and this give cushions the ball in to the stick slightly. Combine that with the awesome low bow from Kookaburra and the Stinger allows players to confidently receive a fast paced ball down the field. I would say the L-Bow suits a forward player most. The curve on the Kookaburra Stinger is 24.5mm, which really is quite an extreme bend. It starts at 220mm up from the ground so is low on the stick. What I review most about the Kookaburra Stinger L-Bow shaft is how much of a kink it takes out of the stick. The L-Bow shape from Kookaburra that you find on the Stinger stays quite straight (it’s not completely straight, there is a bow in the whole stick) until that point 220mm up from the ground where it takes a significant kink out. This makes the hockey stick great for scooping up the ball, spot flicks and aerials, as well as drag flicking. Kookaburra has the “Skill Zone” in some of its heads, its in the Stinger. It is a subtle concave area on the face which king of wraps around the ball. Only subtly. I would note this is good for dribbling, 3D stuff and generally lifting the ball. I do find it means you need to be pretty accurate when hitting the ball with a straight bat though. Players who play as a forward, who receive the ball, turn, dribble round defenders and even the goalkeeper to make an open goal to push the ball hard in to, will appreciate the overall layup of the Kookaburra Stinger. Reverse side hitters will also enjoy this hockey stick. The Stinger has Kookaburra’s revers edge reinforcement that basically has additional material reinforcement on that reverse edge that you catch when slashing out at a ball on your left hand side. It mainly adds additional power to a shot that is weaker for most people. Above all the tech in the Stinger my favourite part is the grip. There are lots of beautiful leather grips around now. Kookaburra haven’t bothered with that in the Stinger but they have made a damn fine handle that is tacky and easy to hang on to. The 2015 model of the Stinger looks great too. Kookaburra never go too crazy with designs and this stick is a great mix of vibrant colour and traditional style. The gloss black on the back looks particularly cool with the carbon weave effect in it. Overall a really great hockey stick for those players who are hoping to develop the skills that suit a low bow hockey stick without spending way more than they would like to, just to develop their skill. If you consider yourself a close control attacker who wants to advance 3D skills and drag flicking, have a season or two with the Kookaburra Stinger and work on your technique before committing to a hockey stick that might be twice or three times the price.